The lush green farms of Maragua constituency in Murang’a County were the backdrop for a bamboo project launched on 23rd April 2013 as a joint effort between Green Belt Movement (GBM) and Waterstone, an organisation whose mission is to contribute to a cleaner environment and promote the innovation of green business opportunities. 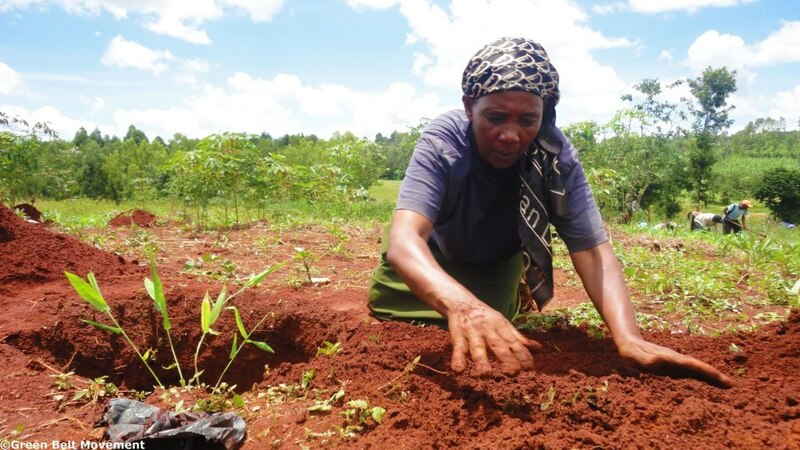 A two-day intensive training workshop was conducted at Kitil farm where women representatives from Maragua were trained on how to effectively grow bamboo and its economic value. Over 1,200 bamboo seedlings were planted on a five acre piece of land with all those present taking home two seedlings each. 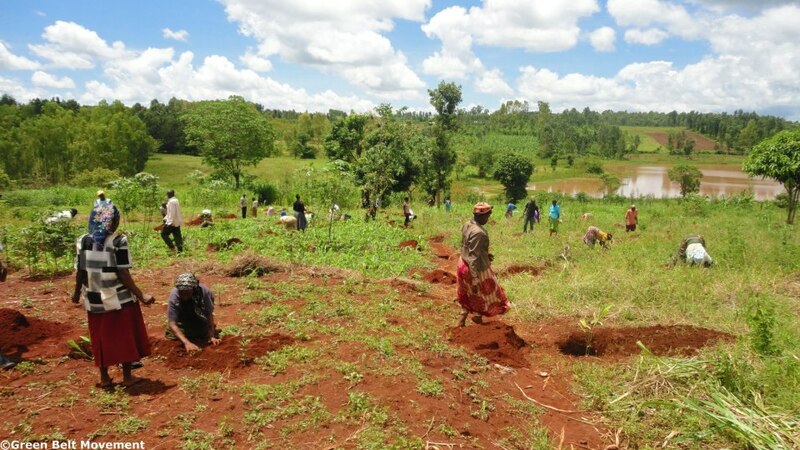 Over 1,200 Bamboo seedlings were planted in Maragua Consituency. Photo: Green Belt Movement. In Kenya, more than 80% of the rural population depends on charcoal for everyday cooking. Less than 2% of Kenya’s forest cover remains and, if the remaining forest is to be conserved, new sustainable alternatives for wood and wood products need to be identified. New generation bamboo plantations have the potential to be part of the climate change solution as well as to help secure energy and rural livelihoods through the development of bamboo-based businesses. The event was led by GBM Board members, GBM Executive Director Pauline Kamau, and Waterstone’s Board Chairman Ole Bernt Frøshaug. Speaking at the project launch, GBM Honorary Treasurer, Mrs Lillian Wanjiru Njehu, urged the community to carry the project forward for the sake of future generations. She asserted that the project belongs to the people of Maragua and emphasised that GBM serves to facilitate and provide guidance. Mrs Njehu also encouraged the women to take good care of the seedlings in order to ensure success of the project and a healthier environment. GBM Executive Director, Pauline Kamau, applauded the women and community members for their large turnout and devotion to this project. She advised the community to tend to the farm diligently and not be driven by the economic value of the bamboo but rather by the hope for a healthier environment. In his keynote address, Waterstone’s Ole Bernt Frøshaug persuaded the local community to take pride in the project, “we have to be proud of what we are starting, we are educating ourselves and this piece of land is our school”. 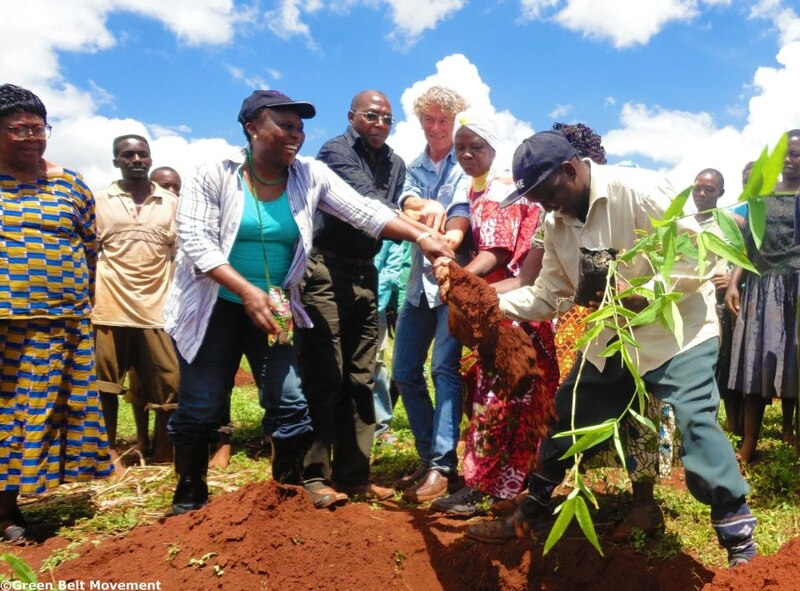 Frøshaug said that it was not by chance that his organisation teamed up with GBM; he had met Professor Wangari Maathai in the past and they both shared the vision of a greener and sustainable environment. GBM Executive Director Pauline Kamau and Waterstone’s Ole Bernt Frøshaug attended the launch of the Bamboo Initiative and got stuck in with the planting! Photo: Green Belt Movement.